Special Weapons and Tactics, the elite law enforcement officers who take on the most dangerous criminals in the highest risk environments. The SWAT Identification Morale Patch from Maxpedition marks wearers out as a first-class SWAT team member, or at least an admirer of their work. It is made from ruggedized, flexible PVC rubber for reliable and lasting service life. Its hook-backing attaches easily to any loop surface, such as the ones found on many tactical and outdoor bags, including Maxpedition's own line. 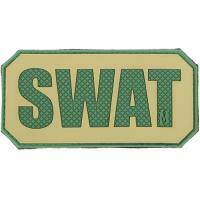 The SWAT patch also comes with its own separate loop sheet that can be sewn onto combat uniforms or accessories, or to protect the patch's hooks when not in use.